Opinion: Can council-funded sport survive austerity? Please go to the full article on the Sports Management website here. Local authority sport and leisure services continue to be at the sharp end of funding cuts and it has never been more important to consider how organisations navigate these constrained fiscal times. Local government is in a phase transition and operating within a period of super-austerity. Recently we explored the management strategies of non-profit sport facilities in this era of austerity. The headline findings highlighted two major challenges – reduced local authority services (ie, funding for maintenance, repairs or parks teams) and increased site operating costs. The management strategies adopted by facility managers to successfully navigate austerity included flexible pricing strategies, strong partnership working and income diversification. In summarising the protective management strategies utilised by organisations and facility managers to navigate austerity, three characteristics should be viewed as favourable. These are: diversifying income streams; a link-up with a larger, established community organisation to share management functions and access to participants; and being well-networked, with links across other similar local and regional organisations and community stakeholders. Ultimately, participation in sport is based on the user experience. The challenges associated with austerity cuts are reducing the quality of these experiences. To strategically move forward, more platforms are required to allow large-, medium- and small-sized organisations and facilities to network, share, inform and support and to assist in the development of collective strategic capabilities. 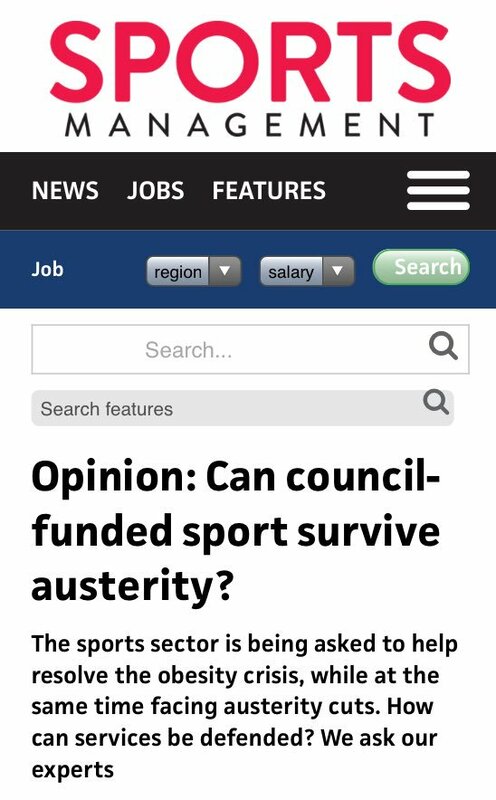 Next Is austerity the biggest threat to sport of our time?